There was one glorious day of sunshine. It was our last day. Tammy asked me where I wanted to go. “East Point?” I said. I wasn’t sure what was even there, except a lighthouse. And I had seen other lighthouses, and maybe they were all the same after awhile. But it was too nice a day to stay indoors, and with any luck there would be a beach, and there would definitely be water and sunshine and fresh air. We took off with two other family friends, Lan and Minh, and Lucy, Tammy’s Sheltie. Lucy is an older dog with arthritis and cancer, and she is a good traveling companion. I miss having dogs—not as much as cats, but I grew up with dogs, and Lucy is a very good dog. It didn’t take long to get to our destination. I grew up near a river, and water makes me happy, but there is nothing like the sight of boundless ocean to ground and heal me. (Technically it’s the Gulf of St. Lawrence, but you know.) I took photos of the water and the boats at work, but mostly I enjoyed the air and the sound of water. I was high up from the waves, and from certain positions I was able to pretend that the rest of everything was gone, no other people, no buildings, just me at the end of the world. It was a kind of peace that I didn’t even know I needed until it came to me. 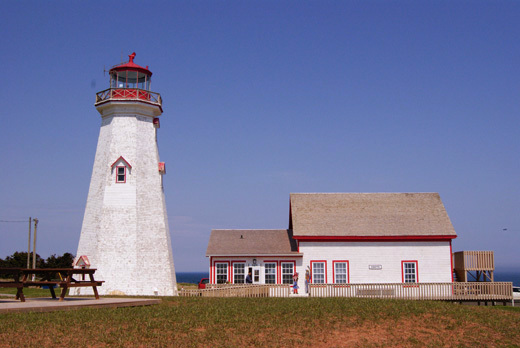 Unlike the other lighthouses I saw on the island, the East Point lighthouse is a tourist destination, complete with gift shop and garish signs. (And you know what I think of that.) So I took some pictures of the structure but didn’t go inside. Other cars pulled up, and people with enormous lenses and tripods began to shoot commanding views of the water. I walked away from the others in my group, toward an area of tall grasses in front of a stand of trees that had been pummeled from the sea winds. And then a fox came out. At first it just trotted around, and I took its photo, amazed that it allowed me to get this close, even though it was obviously used to tourists. Soon enough, it got in a staring contest with our Lucy. Our Lucy, she of the advanced age and the sore joints and the cancer. Time stopped, in a way that none of us could have expected. It’s one thing to dissolve into the view of water endlessly crashing into rocks, and quite another to watch two animals locked in silent communication. Both scenes are nature, free of human interference, but during those moments while we waited, all the water-induced peace vanished and tension arose. I wished you were there to see it with me. I hoped Lucy would be okay. I wanted one of the animals to swish a tail and make the first move. My heartbeat was loud and insistent. Did Tammy call Lucy and try to get her to come out of the trance? I don’t even know. I went down on my haunches and shot into the sunlight, trying not to startle either Lucy or the fox, channeling the part of me that watches nature documentaries and hoping that one of the shots would turn out all right. Then they took off. I don’t remember which one twitched first, but the fox took off through the grasses and into the thicket of windbent Seussian trees. Lucy followed with a speed and agility that I could never have imagined I’d see, racing through the brush after the fox. Tammy called for Lucy to come back, but the trees were silent. Somehow she didn’t panic, and we four humans walked down a trail that ran perpendicular to the trees, slowly enough that Lucy would find us if she came out. I tried to remember what I knew about foxes, dogs, foxhunts, and rabies. It was a mishmash of trivia that didn’t matter at all unless Lucy was okay. And then she was. She trotted back out from the thicket, the fox nowhere to be seen, and joined us on our walk down to the beach. No sign of a limp, and her happy Sheltie smile was intact. Tangles of blackened seaweed on the path attracted flies, and the water grew louder. Nowhere had there been a sign that said No Trespassing, but neither had there been one that said This Way to Beach, either. From the worn path it was obvious that many had gone before us, so I followed along, bringing up the rear. I have seen black sand beaches, green sand beaches, and plenty of white sand beaches, but this was my first red sand beach. Compelling and different, especially that day, when the rocks around me were illuminated by full sunshine, when the sky and water were so boldly blue. Tammy took off for a long walk with Lucy, Lan selected pebbles from along the shoreline, and Minh sat on a broad rock and watched wave after wave. I took a few photos from far away, keeping everyone small against the umber and blue, and then sat on some rocks myself so that I could be in the moment. Part of me wanted to stay until the sun went down. It was an unexpected idyll. Tammy showed me the stones she’d collected from her own walk with Lucy, whose fox-forest secrets we will never know. Tammy is an accomplished jewelry maker and her handful of stones were well selected, some for aesthetics and some just for the way they felt in her hand. 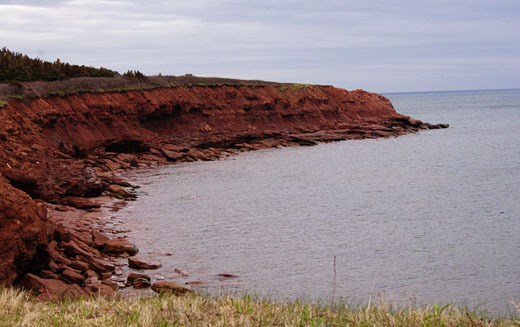 I bent down and picked up a dozen or so tiny shells and a handful of red sand, and then hiked back up the rocks and along the trees, wondering about the fox and walking slowly enough to keep from losing a single shell. I came back to the car and let my eyes linger on the view a little longer. I tried to tell myself that if I lived amid such beauty I would never take it for granted, but those are the kinds of promises I can’t keep. It might be why I’ve moved around so often, trying to keep my eyes fresh. I can’t move house the way I used to, but I can do this much, sometimes, and open my eyes so wide I can feel it in my spine. And I can share it with you, of course. That helps. When I was a little girl, my grandmother gave me the fourth Anne of Green Gables book, Anne of Windy Poplars, as a gift. It’s the story of the years that Anne had a long-distance relationship with her one and only Gilbert while she worked in Summerside, PEI, teaching at a girls’ school. This does mean that all of the carefully constructed will-they-or-won’t-they from the first three books, which I read after Windy Poplars, was forever lost on me. What matters is that Grammy’s gift had two lasting effects on me: First, I will do everything I can to avoid reading books in a series out of order. Second, I joined the Cult of Anne. I still reread my Anne books every few years, still quote from their obscure passages without even caring if anyone knows what I’m talking about, and still think about the giddiness that would have come over the little girl I used to be if she’d only known that someday she would end up living in Canada. Now, living in Ottawa doesn’t equal Avonlea or really anything close to it. And as an adult and a person who viscerally detests tourist traps, I never even suggested to Myron that we go. Someday, I thought, maybe someday when I can go by myself, just to see. But I wasn’t about to say no when the opportunity presented itself. The day we drove from the B&B to the north shore of the island took me by surprise. That morning, my friend Tammy had the map open at the breakfast table to plan the route. I wasn’t mentally prepared to go—I’d been expecting to stay close to home that day. But I threw together a small bag of items and we headed out across the island. It was another cold, gray day and the only appealing visuals came from the beautiful contrasts of the red farm fields (most were prepared for potatoes, with deep grooves in the earth) and brilliant green grass and the many beautifully painted farmhouses. After all these years of living in a suburbia where the houses are beige, off-white, and brown with the occasional red brick, it was elevating to see aqua blue and butter yellow houses that looked completely at home in their world instead of sore-thumby and loud. It doesn’t take very long to travel most of anywhere on the island. I say this as a person who used to drive four hours to get to a Wal-Mart, so a ninety-minute trip to Cavendish didn’t bother me in the least. We stopped on the way in for a quick lunch—I ordered an appetizer order of mussels and a veggie wrap, but didn’t end up touching the wrap because my bowl of mussels was so enormous. Just a few more minutes down the road, we stopped here to look out at the water in North Rustico. I may have wished for better weather, but I could not have asked for cleaner, crisper seaside air or better music than the wind and water in concert. My aversion to touristy attractions wars with me at places like the Green Gables house and the stuff that’s sprung up around it. There’s a visitor center that shows some sort of video (um, no) and outbuildings like a barn, woodshed, and granary that have slice-of-historical-life facts posted on plaques. These things have no appeal to me—all I cared to see was the house, a place where I expected to suspend my disbelief and forcibly place myself in the books I know so well. 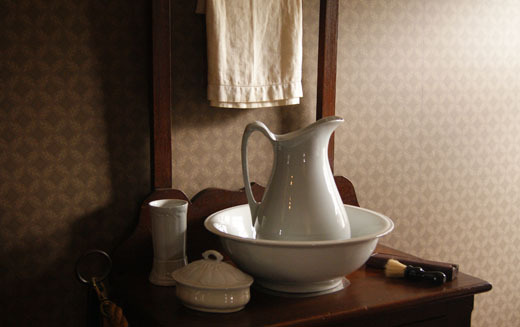 This house is the Macneill house, which Montgomery said was her inspiration for the Cuthbert home, and the items inside were collected for the purpose of creating the walk-through experience. The people responsible for it know the books exceedingly well. I stood below the deep slope of the lawn to view the house and imagine approaching it as a small girl with countless hopes. But in fact Matthew’s cart would probably have approached the house from behind. Matthew’s wash stand Puffed sleeves.My photos of the inside aren’t the greatest. This is partly due to the (lack of) light inside and the ubiquitous velvet ropes. But it was fun to be there, in a place much smaller and more personal than you might expect having seen the movies from the eighties. We moved quietly through the rooms, and my friend recited bits of the books as she was inspired by each room. Touring the little house at the same time were an older woman and her brother. There is nothing like meeting another Anne-girl, especially not in a place like that. She observed that the (period-appropriate but exceedingly loud) paisley hallway wallpapers were not what she expected out of a salt-of-the-earth type like Marilla Cuthbert, but then mused, “Of course Rachel Lynde moved in at one point,” and sniffed loudly, indicating exactly what she thought of both Mrs. Lynde and the decor. Later on we stopped at the gift shop on the way out to pick up postcards. You wouldn’t think that you could work the merchandising as hard as they do, but, well, Anne was all about the imagination, and imagination is much at play here. Books and videos and maple syrup, of course, but my two favorite souvenirs are down below. I managed to resist buying both of them, but I might have been compelled to plunk my money down for some comp’ny jam. So here I am, trying to put together thoughts about visiting something like this, something manufactured to replicate a fictional experience. 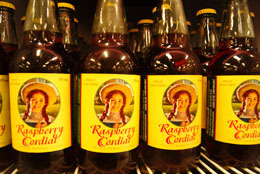 Cavendish is not Avonlea, which doesn’t truly exist. 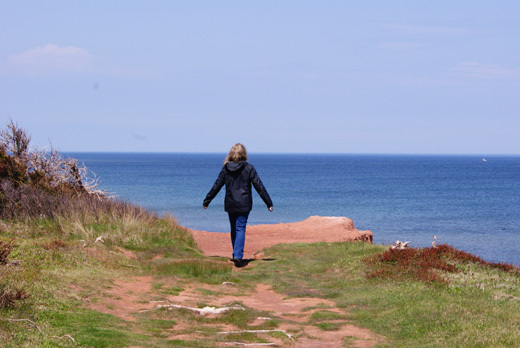 To me, the visit was more about being on the north shore, around the red dirt and the water, breathing the fresh air and walking in the author’s shoes more than Anne’s herself. Maybe this is part of being older, and maybe it’s just that Green Gables is not the kind of place that needs to be reproduced the way someplace like Hogwart’s can be—it doesn’t need an unlimited budget or complete immersion. An amethyst brooch on a nightstand, a geranium in the window… these are magic enough. And Green Gables is in the heart of all Anne-girls, anyway; what’s lovely is to see the echoes of the hearts of so many other Anne-girls made manifest in a plain little farmhouse on a hill.